Never judge a book by its cover. It’s almost like another theme of the set, isn’t it? Never underestimate Battery Jesus. Never underestimate the starting forest. And now, it’s never underestimate a cute-looking dragon that can charge into you and punch you in the face at supersonic speeds. No really, this guy is nuts! Dragonite is a Stage 2 Dragon Pokemon, 160 HP, with a Fairy Weakness, no Resistance, and a Retreat Cost of 3. Dragon Claw is a 3-for-120 that requires you to mix water in a lightbulb-shaped container, preferably one that’s not plugged into an outlet of some kind such that you don’t end up electrocuting yourself. Then you hand over the cut wire to your opponent and ask them nicely to scrape it along the surface of their Active Pokemon while you pour the water on top of the wire. Watch and be amazed as more than 120 watts of power coming pouring out of their card, and immediately how 120 people lose their minds as 120 judges come over to separate you from the lightbulb and the wire, wondering how you managed to power that thing up to such absurd heights with the potato you bought at the store the other day. …oh, right, cause you made a Fast Call to the store to get the potato. That way you could grab the local grocery store clerk, aka your Supporter, who you then revealed to the police before adding him to your hand. Strategically, this lets you get ahead of the competition by thinning your deck out and making your contacts list more manageable. It also lets you grab for whatever you might be looking for, and considering how important Supporters can be these days, it’s no wonder that you’d want to Fast-Trak your way to a Dragonite ASAP. You might be surprised to hear at this point that I didn’t put Dragonite on my list, and once again, that’s cause I’m thinking bout these cons. Stage 2 means you’re running more cards, that’s a given, but will you be able to bring out Dragonite consistently onto your Bench in order to start drawing that guaranteed Supporter for the turn? And unlike with Viridian Forest from yesterday, you can only play 1 Supporter each turn, whereas with Energy there are ways to make it work for you outside of just your normal “play it from your hand” maneuver. Moral of the story though: don’t buy a potato and take it to your local tournament. They’ll never let you hear the end of it. Arora Notealus: …come to think of it, Dragonite does kinda look like a potato. An orangey, dragon-shaped potato, but still. Why do I have potatoes on my mind this late at night anyway? I just had fries earlier today, and yet here’s Dragonite making me hungry for potatoes! Hmmmm, maybe he’ll fly over to Idaho and back and bring me some. Next Time: …wait, this is the only one on this list? Really?? At first glance, Dragonite doesn’t seem like it had much to offer in terms of what’s being printed on the card, except for this ability, which is enough to secure this Pokémon in 9th place. I’ll get the attack out of the way: Dragon Claw costs WLC for 120 damage, which is pretty underwhelming. Pretty shocking that I consider an attack that does 120 for three energy is poor, but in the grand scheme of things, HP scores keep rising, and when you’re facing against a 300 HP monster that you have to knock out, you have to reach even higher numbers. However, backed with Choice Band, Dragon Claw will soundly 2HKO the game….barely. Different energy types as part of the cost is also bad, as you may not get the correct energy in time to power up this Pokémon. So while it can potentially 2HKO the game, it isn’t made to be a good attacker. We have to look elsewhere. Fast Call is the redeeming factor for Dragonite, as it lets you search your deck for a Supporter card and put it onto your hand. Multiple Dragonites in play gets you more uses, but since you can only play one Supporter card during your turn, then having one Dragonite in play is enough. This isn’t like Tapu Lele-GX such that it only works when put into play; Fast Call keeps working every other turn as long as you can keep Dragonite on the field without getting it knocked out or having it turned off. If this ability were to be on a Basic Pokémon, it would’ve been a universal staple, but Dragonite is a Stage 2 Pokémon. You’ll have to figure out a way to get it into play quickly, whether it be using Rare Candy or Meganium’s Quick Ripening Herb to get it into play, plus 2 deck slot dedicated for Dragonite (particularly 1-0-1). Simply put, Dragonite improves consistency, letting you fetch a Supporter to be used right away, whether it would be draw power, energy acceleration, searching, or even disrupting your opponent. Some niche Supporters may breathe new life with the help of Dragonite, but even then, some Supporters can still fail to prove worthwhile, even with guaranteed search, because the Supporters themselves are pretty underwhelming. As good as it is, you have to remember that there are competition against other cards that does a similar thing, even if they are a one & done deal. There are various one-n-done cards like Jirachi-EX, Tapu Lele-GX, Xtransceiver and Random Receiver that also fetches Supporters, but they either are not that reliable and may have drawbacks. Ability denial may not be prevalent in Standard, but Expanded has Garbodor’s Garbotoxin that can just sit anywhere with a tool attached to it. So uh, better have Field Blowers ready. 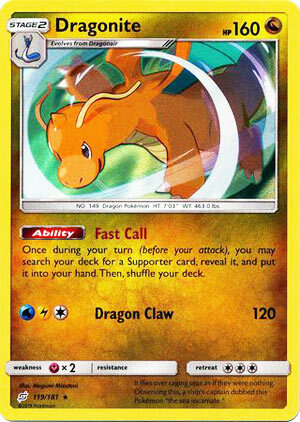 Dragonite (TUP 119) caught everyone’s eye when we first learned of this card a few months ago. The ability to go get any Supporter card you want every turn is potentially one of the best abilities in the game today. It’s such a good ability that you have to consider ways to fit this card into a sixty card decklist and how to get it onto your bench as quickly as possible. …said no one who ran Alolan Ninetales GX LOT, Meganium LOT, or even any of us who played Rayquaza Vikavolt. Seriously, think about how hard it WASN’T to get a Vikavolt into play with Rayquaza GX. I know you can’t devote the same resources in your sixty card list to Dragonite that you did to Vikavolt, but it’s not that hard to get a Stage 2 into play early in the game. We even now have Pokemon Communication which should really facilitate structural development in our offensive plans early in the game. Now we actually have a way to go get a specific Evolution Pokemon with an Item card in addition to Ultra Ball. I don’t know if we should be running four Nest Balls, four Pokemon Communication, and four Ultra Balls, but there’s some combination of those three cards that will greatly improve our early game consistency so much that getting Dragonite onto the bench within your second or third turn probably won’t be all that hard. And having Dragonite means that you can potentially run a number of Supporter cards you might not have considered previously. Mina and Masked Royal become a lot more playable with Dragonite. Cyrus becomes a lot scarier, Lance is a much more feasible option, Guzma becomes so much more potent, and heck maybe some of these new Battle Maisons might even be playable (Tricky Gym has two videos where they pulled off the Hat Trick). So go try out Dragonite. I’ll bet you’ll be able to figure out a way to get it onto your bench early in the game. And then you’ll be happy that you can go cherry pick whatever Supporter you want out of your deck, and your opponent will probably give you the angry red face emoticon. I’ve been using it in multiple decks this weekend and have had very little difficulty getting it into play. Even as just a 1-0-1 line in other Stage 2 decks, it’s very easy to get it on the board early, and being able to grab whatever Supporter you want to get out of your deck and put it in your hand is a little bit like cheating. If you have a deck with 4 Rare Candy, go put a 1-0-1 line in your list. I’ve been using it with Fairy Ninetales GX and it’s been great. Pokemon Communication is SOOOO much better than Ultra Ball, Great Ball, and (this really goes without saying) Timer Ball. Jirachi TEU will help too. Our ninth most promising pick of the latest set is Dragonite (SM – Team Up 119/181). Being a [N] Type has potential, but isn’t particularly good right now. What they have going for them is how nothing is Resistant to them and they have a decent amount of Type-based support, but the former isn’t a major advantage and the only piece of the latter that has really proven itself is Double Dragon Energy (Expanded-only) and Mysterious Treasure. Outside of BW-era [N] Types, nothing is [N] Weak; that isn’t a dealbreaker, but it does hurt. There are also anti-[N] effects, but thankfully, none have really mattered, at least so far. Being a Stage 2 is a pretty big red flag; things are better than they’ve been for Stage 2 Pokémon in a long time, to the point we are even seeing multi-Stage 2 decks reemerge as a viable strategy in competitive play but it still means Dragonite will be slow to the field and take up some serious deck space, at least relative to how many copies you can field. I have not forgotten that there are some shortcuts to directly field [N] Types, but they haven’t proven themselves yet even though they’ve been tournament legal for a little over four months. Dragonite does have a very good HP score, as 160 on something that is NOT a Pokémon-EX/GX tends to be a bit of a tricky OHKO; quite possible for most decks, but only a simple, straightforward matter. The [Y] Weakness won’t matter against something like Granbull (SM – Lost Thunder 138/214), but will against Sylveon-GX or a Gardevoir-GX that isn’t loaded with Energy. The lack of Resistance is unfortunate, but as I pointed out when discussing the lack of [N] Resistance, -20 damage just isn’t a big deal the way the x2 damage of Weakness is. As a side note, that is not a complaint about Resistance; I really wish Weakness was just a simple +20, but (hopefully) that is a topic for another time. [CCC] as a Retreat Cost is not only something you don’t want to pay but which is hard to actually afford even when you needed. It is high enough you’ll need to utilize most of the combos used to deal with even larger Retreat Costs, and you don’t even gain access to Buff Padding (should that card prove relevant). For [WLC] Dragonite can use “Dragon Claw” do deal 120 damage; a little underwhelming when you consider this is on a Stage 2 and you’ve got to deal with mixed Energy costs, but 120-for-three isn’t bad. Which just leaves the Evolution line and the Ability, which I intentionally saved for last. I don’t know if it will ever prove relevant, but just a reminder that Dragonair (Sun & Moon 95/149) actually has a decent attack in the form of “Dragon’s Wish”. Using an attack found on a Stage 1 for Energy acceleration is usually not worth it, but Dragon’s Wish proved to be an exception, at least for a short time. With all the rest said, though, we move onto the main course; the Ability “Fast Call”. Each instance of Fast Call gives you a once-per-turn search of your deck for a Supporter, though you’ve got to use it before doing anything that ends your turn once it resolves (like attacking). How useful is being able to snag a Supporter from your deck each turn? Very! Still, not as useful as I think some make it out to be. Though rare, some turns you just won’t need to use a Supporter. Some turns, you’ll already have the Supporter you need in hand. Some turns, you won’t have the BEST Supporter handy, but you’ll have A Supporter. Some turns, the BEST Supporter will NOT be in your deck. Even though Fast Call works the same way each time, the exact return isn’t always the same, which is important; the exact effects of Fast Call are unique, but the niche it occupies? There’s a lot of competition. Before we get into the other cards you might be running that serve a similar purpose to Dragonite, let’s remember that any “assistance” the rest of your deck provides in fielding Dragonite? That isn’t free. I might manage to make a deck work using a 1-0-1 Dragonite line, I’m running Alolan Ninetales-GX (SM – Lost Thunder 132/214, 205/214, 225/214) and Rare Candy BUT that still counts against how much deck space I’m dedicating to the line, whether I’m only running the cards to play Dragonite or “sharing” them with other Stage 2 Pokémon in my deck. This doesn’t automatically make a card or combo “bad”; good decks are built around combos! It does matter when we consider the alternatives to Dragonite, however. First up is the obvious one, Tapu Lele-GX, and its “Wonder Tag” Ability. You still give up a spot on your Bench to use an Ability to fetch a Supporter, but it is a one-and-done trick, and for better and worse you’ve got a Basic Pokémon-GX on the field with 170 HP, a solid attack, and a decent(ish) GX-attack. Tapu Lele-GX isn’t in every deck, but it is in most decks because of how useful searching out a Supporter is… especially on your first turn, a time when Dragonite just can’t help you. Magcargo (SM – Celestial Storm 24/168) is a Stage 1 with the Ability “Smooth Over”, which lets you top deck any card from your deck. Anything that lets you add a card from the top of your deck, whether as part of a search effect or as draw power which doesn’t shuffle the deck first, lets you fake being Dragonite. Magcargo is smaller and easier to OHKO, though, and needing something else to complete the combo means it may ultimately take as much or more space than Dragonite… but if you do then you can also snag any card, as opposed to just Supporters. Speaking of draw effects which are not Supporter-based, Oranguru (Sun & Moon 113/149; SM – Black Star Promos SM13), Swampert (SM – Celestial Storm 35/168), and Zoroark-GX are all competing with Dragonite as well. Notice how we’ve just named some of the best Bench-sitters in the game, and some of them are even seen as good attackers. Dragonite doesn’t just have to possess a useful effect, it doesn’t just have to be a feasible deck inclusion, Dragonite needs to outperform any of these cards it cannot also perform well beside. For the Standard Format, I suspect there will be something where that happens, sooner or later. Maybe even in the Expanded Format. I’m just not sure when; Tapu Lele-GX and Zoroark-GX were amazing right away, while Magcargo, Oranguru, and Swampert took some time to prove themselves. The “Battle Chatelaine” series of Supporters might justify multiple uses of Fast Call in a turn, or the old Magnezone (BW – Plasma Storm 46/135) and its “Dual Brains” Ability, or the upcoming Lt. Surge’s Plan. Dragonite isn’t a must run in the Limited Format, but it comes pretty close; unless you’re trying to build your deck using a single Basic Pokémon (which ensures it is your opening Active), even if you don’t have many Supporters, you probably want to include even a 1-1-1 Dragonite line. As you can tell, I’m not sold on Dragonite. I think it has potential, but I’m uncertain as to whether or not it will ever be realized. I’m almost hoping this will be another of those “silly Otaku” moments, where in a few weeks or months or even years, we come back and I’m apologizing for having been too hard on Dragonite. None of what I’m saying is based on direct playtesting, but it is based on past experience with similar cards.